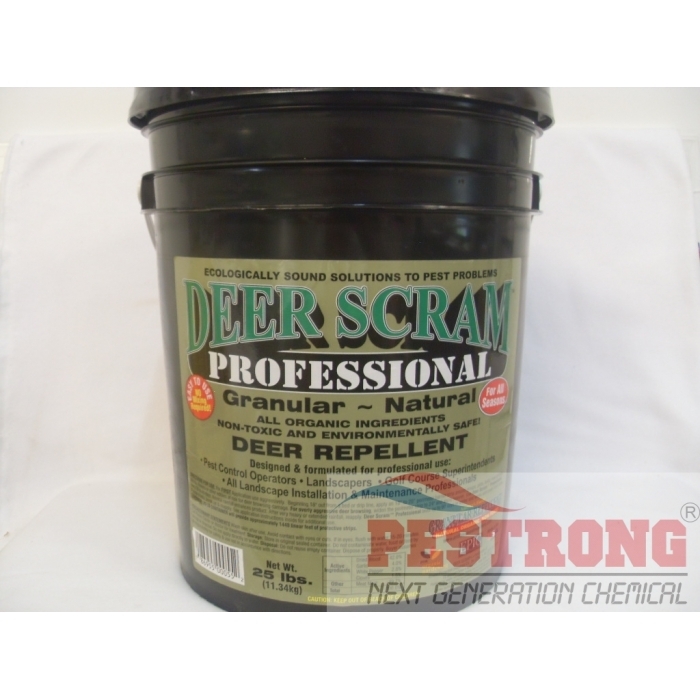 Where to Buy Deer Scram Professional, Deer Scram Professional Repellent - 25 Lb - $96.25 for Sale with Fast Free Shipping! Deer Scram Professional Repellent - 25 Lb is all natural, biodegradable, environmentally safe and guaranteed to keep deer and rabbits away from your prized gardens, shrubs and trees, while not being offensive to humans. Do your favorite plantings suffer deer damage? Do your favorite gardens need deer protection? Are deer problems ruining your favorite flowerbeds? Are you looking for a guaranteed method of deer or rabbit control? Deer Scram won’t harm animals, the environment and, most importantly, you and your family. Blended from selected organic components, Deer Scram will keep deer off your plantings because it convinces deer that harm is nearby through their uncanny sense of smell. Deer Scram will change deer behavior. As they near the applied barrier of Deer Scram, deer actually alert to a sense of danger – even death! Apply Deer Scram any time of year! Apply Deer Scram now to stop deer browsing, change the paths the deer have grown accustomed to using through your yard and guard your gardens, trees and shrubs! Deer Scram can be applied as a protective perimeter strip or it can be evenly spread over a garden bed or flowerbed. Deer Scram will shield your flowers, shrubs, trees, ornamentals, vegetable gardens, forests, vineyards, orchards, field crops and nursery stock when used as directed and consistently applied every 30-45 days. Deer Scram will keep deer away for good but will not harm the deer. Use Deer Scram to keep deer out of any botanical areas. Get plant protection now! Each scoop provided will make a 20 linear foot strip 18 inches wide. Ready to use (no mixing). Just sprinkle. Reapply after very heavy rain. Non-Toxic organic for use all season. All Natural. Seems to work well if it doesn't rain or your irrigation system doesn't wash it off. Applied in May and after one week of heavy rains, the deer attacked my hosts and lilies. I reapplied at the beginning of June and then again at the end of June. Less then one week later, deer made it through the scram barrier that I has scattered and attached my hosta blooms. I have had success in the past, but this season it doesn't seem to be as effective. Not sure if it's the rain factor, bolder and hungrier deer, or guilty of product going down . . . Very disappointed! I have been using liquid fence with reasonably good results. A neighbor recommended Deer Scram. I applied a heavy boarder around the perimeter of multiple beds. Within a couple of days plants in several locations were completely stripped. Expensive mistake. We have used Deer Scram for a coupe of years and found it to be the most effective deer repellent we have found. I can not tell you how many products I have tried to keep the deer from eating my plants. Nothing has even slowed them down until I tried deer scram. This stuff really works! We have even seen the deer come over to my plants smell and walk away. Highly recommend this product. I have doubt this at first time. But It works. Don't waste money for buying mimic product. This is a great product . The price, you can't beat and the delivery is prompt. I would give Pestrong and the product five stars!